Slightly ahead of schedule, the HP SlateBook X2 Android tablet is now available for purchase straight from the company's online store. It is a device that HP announced back in May, meant to suit the needs of people interested in a convertible Android slate. As such, it comes bundled with a detachable hardware keyboard dock, but can be used separately as any other Android tablet. Specs-wise, the HP SlateBook X2 does have a lot to offer, including a 10.1-inch touchscreen with a resolution of 1920 by 1200 pixels. Under the hood ticks a 1.8GHz Tegra 4 SoC backed up by 2GB of RAM. The on-board storage is just 16 gigs, but a microSD card slot is present, capable of handling cards of up to 32GB in size. In addition, an extra SD card slot and a full-sized USB port are available on the keyboard dock. A pair of cameras – one in front and one at the back of the tablet – are present for taking photos and for video calls. With the help of that extra battery tucked inside the keyboard dock, the HP SlateBook X2 should last through a full day of active use. Currently, the HP SlateBook X2 is priced at $480 with the keyboard dock included, which does seem like a fair price for what the device is capable of. Get your credit card out and follow the source link below in case you're interested. i'll probably be getting this soon. do a review on it soon please! Competition is pretty intense right now with the S800 and Exynos Octa 5410 (5420 soon) so I'm definitely interested on how well the Tegra 4 chip performs. Beats Audio would have been a nice edition. But not bad for the specs. Good price and specs. I'm honestly surprised this is HP and not ASUS. been for sale here in finland for a couple of weeks, but no reviews up anywhere. don't think so... Intel's HD4000 exists on Intel CPU's only (on the same die as the CPU) you must be confused with some other model. Comment from another website: "Just spoke to HP about this, it is officially in stock today and shipping today. Regarding the Tegra 4, it is indeed accurate that it is matched to a Intel 4000 GPU. This particular Tegra 4 is a variant of the one found on the NVIDIA Shield. The rep told me that NVIDIA has been working with Intel on this setup and HP did let the reps use the device for limited time and he said said it is very fast and fluid, also that the screen is sharp with little to no pixelation." If this is indeed the case... 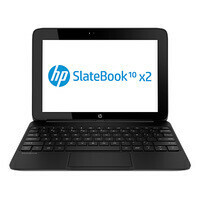 THE HP SLATEBOOK WILL BE THE MOST POWERFUL GAMING TABLET EVER MADE, AND WILL CONTINUE TO BE SO FOR A VERY LONG TIME!!! The only thing I'm worried about is app compatibility. sorry but I still feel it's highly unlikely, I've seen similar mistakes across many manufacturer's saying that their current gen ATOM's had Intel GMA graphics when they infact had powerVR graphics. there would need to be a coordinated effort from intel to land one of THEIR graphics chips on an Nvidia SoC system, the Intel HD4000 is designed as part of an Intel CPU and not anything else. we'd have heard of it if they had been working on such a thing. On Hp's website on the purchase page, under specs it's listed as intel hd graphics 4000; that seems like a pretty serious mistake being as it is going on sale.